TORRINGTON, Conn., Sept. 4, 2018 /Christian Newswire/ -- Eight rare Relics of the Passion, with a unique musical and meditative program focused on the Passion of Christ, will be presented at multiple churches in Louisiana from September 12th through September 19th. 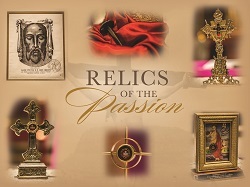 The program, entitled "Call from the Crucified Heart," is a unique one-hour presentation of The Passion that couples holy relics with supporting meditations and musical pieces that serve as a guide to help you accompany Jesus through His suffering during the Passion. The program ends with an opportunity for personal veneration of the relics. The Apostolate for Holy Relics, guardians for these relics, has toured across the United States throughout 2016, 2017 and 2018. Having the opportunity to join in this program while they are here in the Diocese of Lake Charles in Louisiana is sure to be an experience that will help you connect with the very roots of your faith. It's very rare to see a group of related holy relics all in one place as is presented in this program. Collections such as this are generally seen only in Rome or the Holy Land and is something that most people only get to see once in a lifetime. What's significant about this collection is that these relics are brought into a single venue with a unique narration that brings the story of the Passion to life. Documents for these relics have been reviewed and authenticated prior to the commencement of the first tour in 2007 and have been venerated in events throughout the world. A picture of (the effigy of) the Veil of Veronica touched to the original with a Vatican seal attesting to the fact. Additional information regarding the AHR and their upcoming tour with the Relics of the Passion in Louisiana, can be found at www.relictour.org.